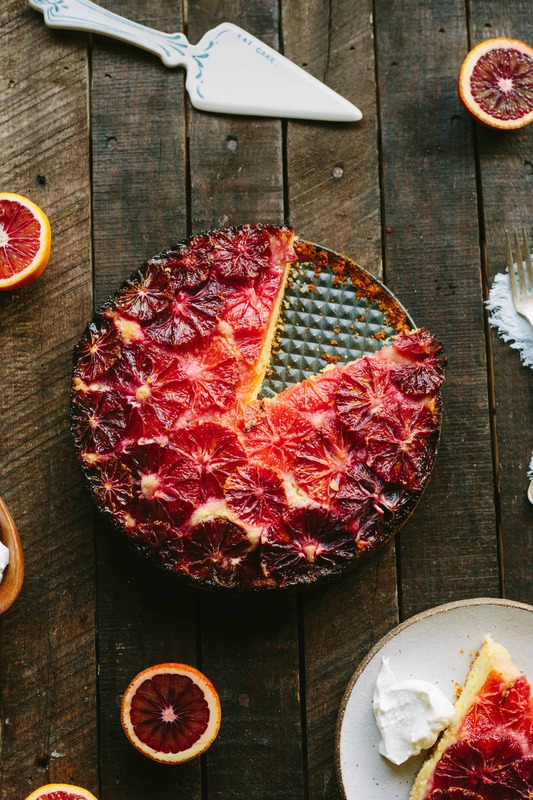 This recipe for Blood Orange + Almond Cake is a beautiful winter citrus dessert with a tender, moist crumb from the addition of yogurt and almond flour. Well, she sure is pretty. But everyone knows it’s whats on the inside that counts. 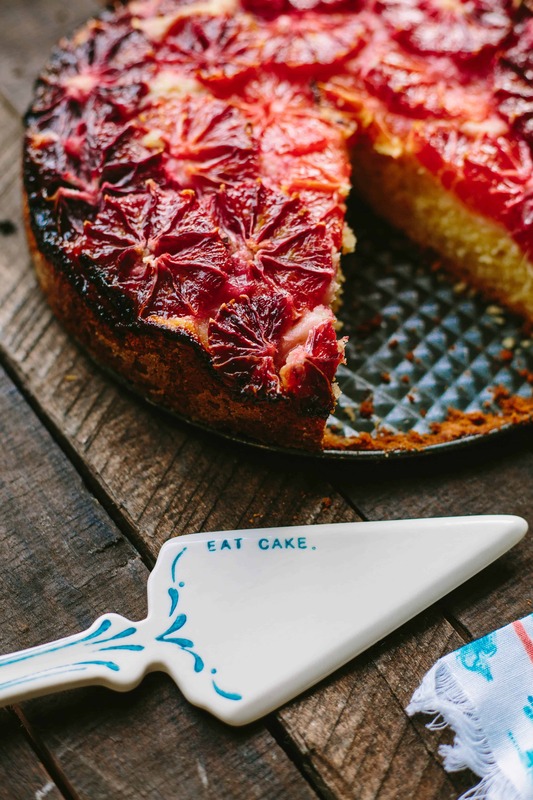 This cake is the culinary equivalent of a supermodel, but inside she’s lacking a bit in the personality department. Truth be told, it’s all my fault. I kinda screwed this one up in more ways than one, but the pictures were just way too pretty not to post. Worry not my friends, this isn’t all in vain. I’ve made adjustments to the final recipe so that you – and I – won’t make those same mistakes (again). The inspiration for this pretty little number came from two things: 1. 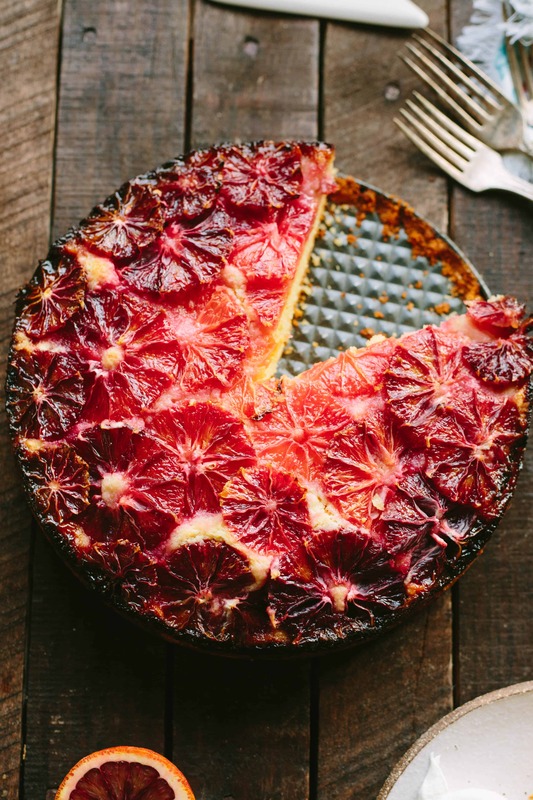 A desire to bake something with blood oranges, my favorite winter citrus variety. And 2. Wanting to reinvent this cake from last year using a different fruit. 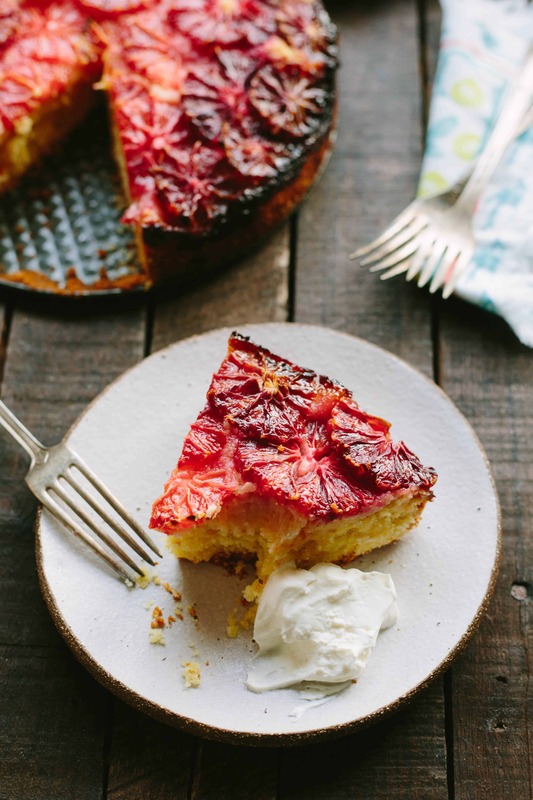 I completely fell in love with this cake for it’s unique, tangy flavor and incredible texture. It had a dense, creamy crumb and chewy crust resulting from a bit of almond flour and yogurt in the batter. The rhubarb gave it this slightly sour, yet perfectly balanced flavor that kept you coming back for bite after bite. 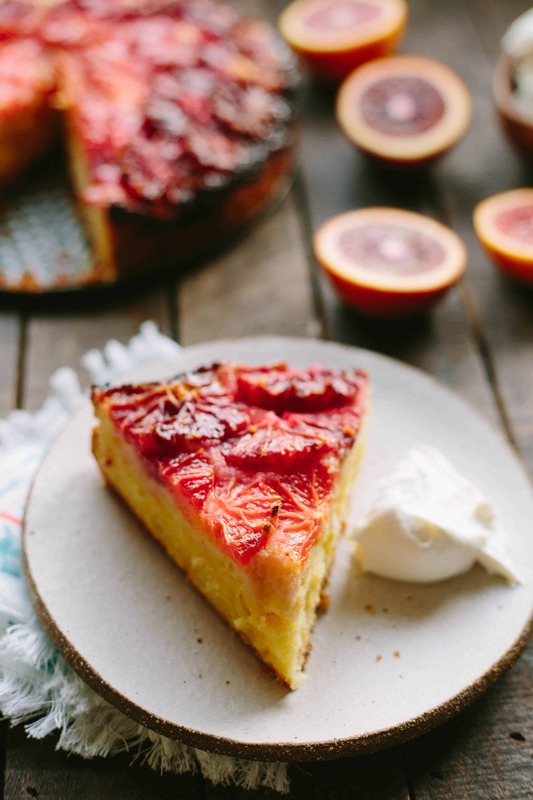 Once rhubarb fell out of season, I couldn’t stop thinking about all the other fruits that would work well nestled into this base. 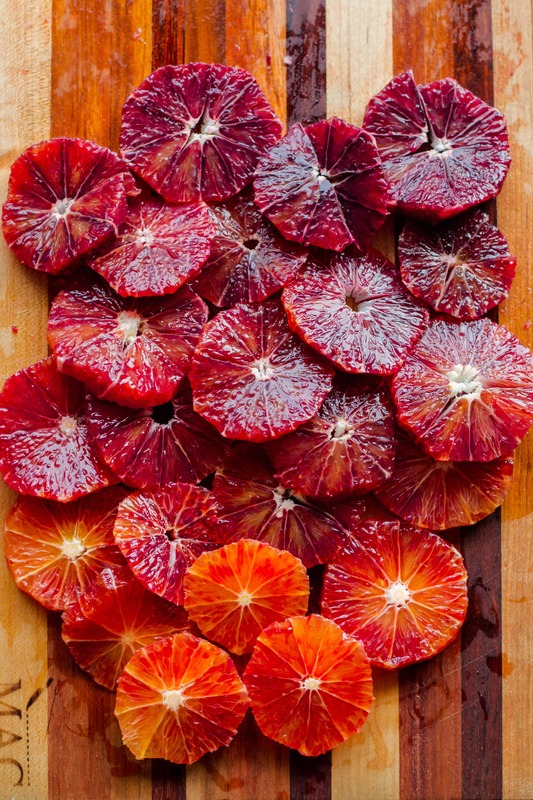 Blood oranges, of course, were high on my list of fruits to try first due to their deep, glowing range of ruby colors. Like rhubarb, they have some tang to them and I thought they would pair nicely with the almond. But unlike rhubarb, they are also sweet, and incredibly juicy. This is where the trouble began. Unlike with cooking, where you can taste the food throughout the process and make adjustments as needed, baking can’t be tested until the dish is totally done. This was one of those situations where – after spending hours baking, styling, and photographing the cake – I took my first bite and couldn’t tell if I liked it or not. It wasn’t bad… It just wasn’t quite what I was hoping for. Then I took another bite. I was still on the fence. Before long, I’d eaten half of the cake just trying to figure out if I liked it or not. After it was all said and done (and by done, I mean shamelessly eating the rest of the cake straight out of a pan, by myself, while Chaser was traveling for work), I realized that I didn’t dislike the cake, I just didn’t make it right. Here’s what was throwing me off: first and foremost, the cake was overcooked. The outer edges were so dry that they were lacking the irresistible chew of the rhubarb version. While it was baking, I wanted to take it out of the oven around 50 minutes or so because the outer edges looked like if they went any longer they would burn. But the inside still seemed goopy, and considering the dark hue of the blood oranges, I figured they were probably okay. So I let it go… 3o minutes more until a toothpick came out of the center clean. In hindsight, I should have taken the cake out right then and there. My cake was definitely on the dry side, and those edges were most definitely past the point of being caramelized. It now makes sense that the top would have still been a bit loose, as the oranges leech out so much liquid as they cook. I’m fairly certain that if I’d taken the cake our earlier, once it had a chance to cool it would have set up just fine. The edges would have been perfect and the inside would have been dense and creamy, just like the original. The other thing that threw me off, was that compared to the rhubarb version, this cake lacked depth of flavor. Rhubarb is so tart, so to mimic that I adjusted the recipe to include a generous amount of lemon juice in the batter. I also upped the original amount of orange zest, because the flavor just wasn’t coming through. Over the weekend I was telling a few friends about this cake “fail” and how I wasn’t sure if I was going to post it. They all said “I bet if we ate it we’d think it was amazing. You’re always so critical of your own work.” And you know what, they’re right. 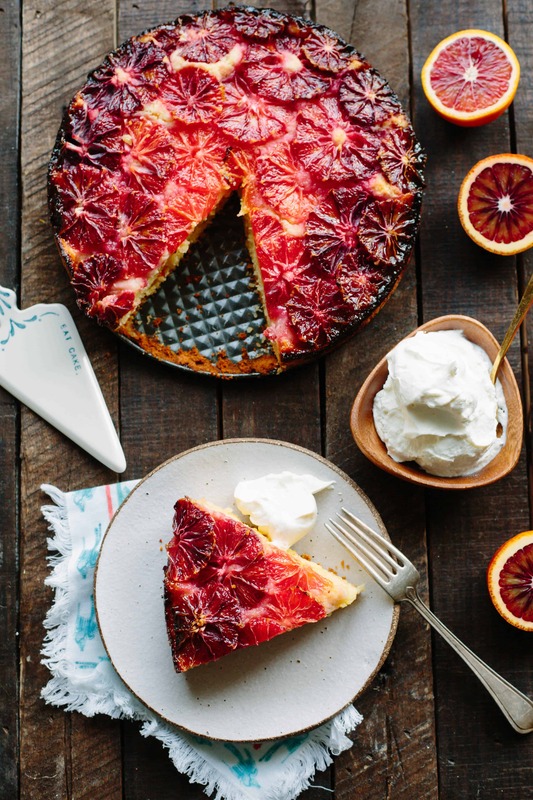 So I decided it was better to share it, to tell about my mishaps, how to correct them, and ways to make this cake even better… Like swapping out the oranges for grapefruit. I don’t know why I didn’t think of that in the first place, but grapefruit would be absolutely brilliant here. Of course, it wouldn’t turn out to be nearly as pretty as these blood oranges, and despite what some people might tell you, looks are important. Preheat oven to 350 degrees. Rub the inside of an 9″ springform pan with butter, then sprinkle with a little bit of sugar and swirl it around the pan to coat. Tap out excess. Use a microplane grater to remove 2 packed teaspoons of zest from the blood oranges. Next, use a sharp knife to slice the top and bottom off each orange to reveal its flesh. Place cut side down, then run your knife down the sides to remove the peel and as much white pith as possible. Turn the peeled oranges on their sides and slice into rounds. Whisk together the flour, baking powder, salt and almond flour in a bowl and set aside. In a large bowl, cream 1 cup butter with ¾ cup sugar using a stand mixer or electric beater. Add the blood orange zest, scrape in seeds from the vanilla bean, and continue beating until light and fluffy, about 5 minutes. Add eggs, one at a time, being sure the first egg is fully incorporated before adding the second. Add the lemon juice and beat until mixture is pale and fluffy, about 4 minutes more.Add the dry ingredients, a little at a time, while beating on low speed. Add the yogurt and stir until just combined. 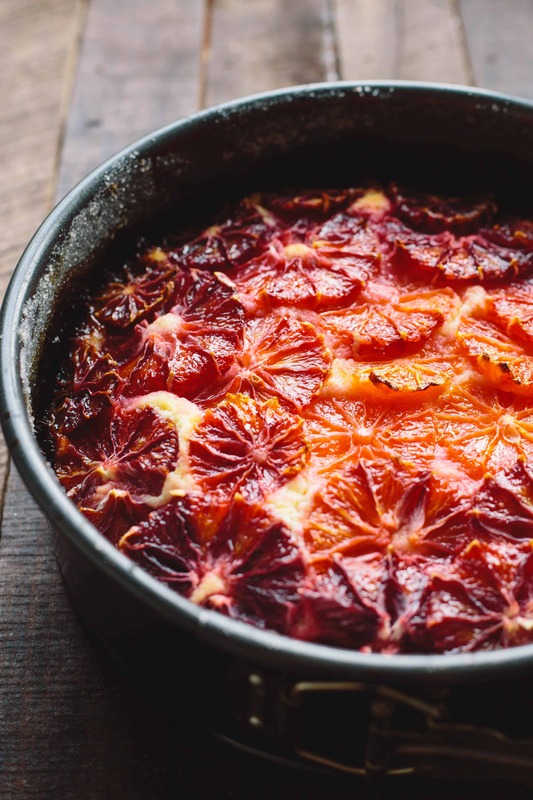 Spoon the batter into the prepared pan, smooth the top, and arrange the blood orange slices over top in a pretty pattern. Sprinkle the remaining 2 tablespoons of sugar over top, avoiding the very outer edges. Bake for about 45 minutes to one hour, or until the oranges are lightly caramelized around the sides and the center is mostly set. Allow the cake to cool completely before slicing and serving with dollops of Greek yogurt. I find it’s best served cold. Keep refrigerated. That’s the most beautiful cake ever. And despite all you said, I just don’t see how that couldn’t taste like heaven. I like dry-ish cakes with coffee. I’m gonna shop around for a new recipe plugin. I’ll let you know what I find. I think it was the burnt oranges and dried out crust combined with the overall denseness of the cake that threw me off. I’m 99.9% positive that with the adjustments I made it would taste just right. 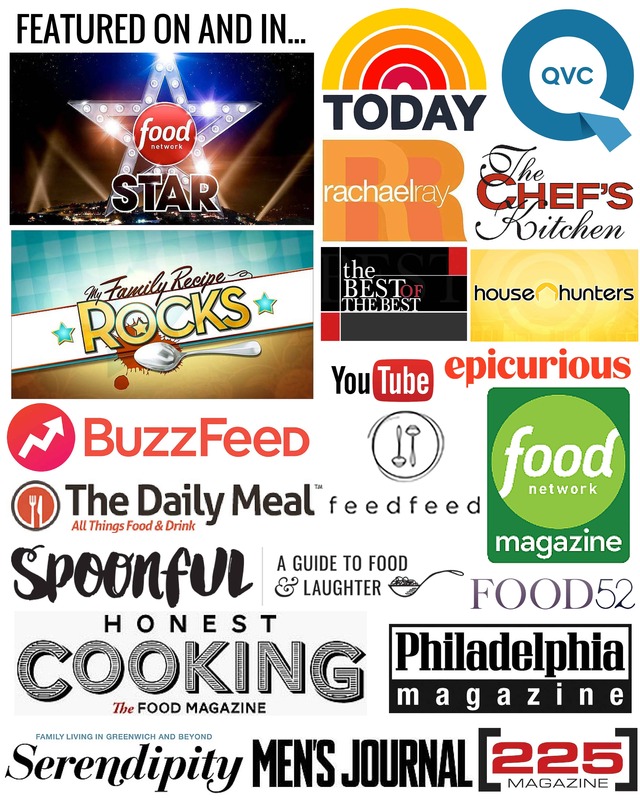 I’m thinking about installing the Yummly recipe plug-in since I believe it somehow links up with their site, but need to do more investigating. Please report back on what you find! I will too. Whisk confectioners sugar with 2 tablespoons blood orange juice to make the glaze. Pour over cooled cake. What a beautiful cake! 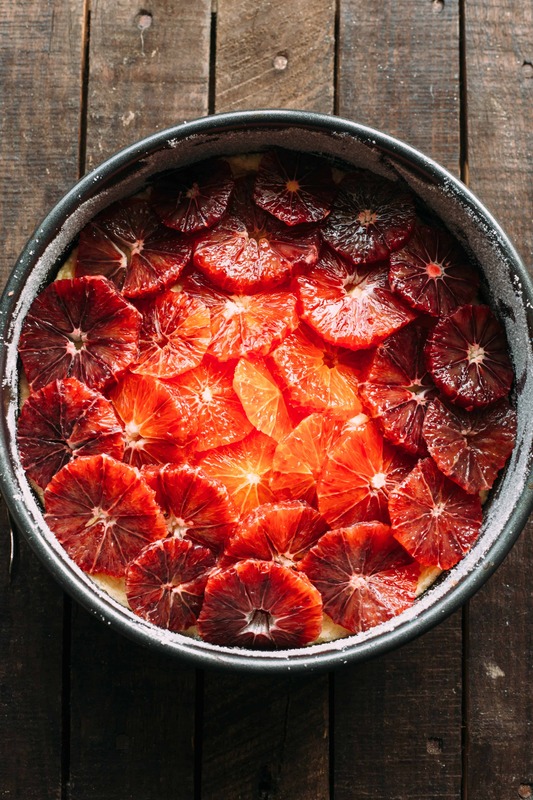 Those blood oranges are gorgeous!